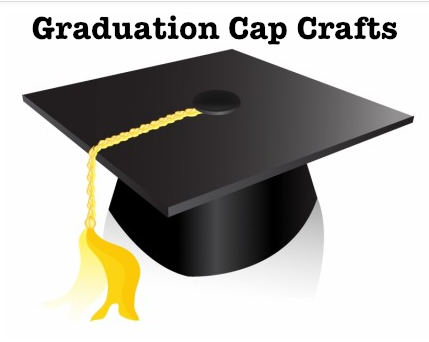 Use these quick easy graduation cap crafts when preparing for your graduate’s celebration. There are also ideas for making a graduation cap box for presenting a gift. More graduation crafts ideas are available here. Print this square petal template from Mirkwood designs in school colors and fold to make a graduation cap card that will hold folded money or a gift card. Make a graduation cap card with this free printable. Add money or a gift card inside the card. Fold a graduation hat napkin with a few easy folds. Make a foldable hats off to the graduates cap that could be used to hold a gift card or as a gift topper. Make this easy grad cap box to hold cash, a gift card, or use for grad cap favors. Craft an easy mini graduation cap with an egg carton cup and a square of cardboard. Paint in school colors. Make graduation treats by putting a popsicle stick into a Reese Peanut Butter Cup and topping it with a square of chocolate bar. Add a candy or frosting tassel. Do be aware of people with peanut allergies – you could substitute Rolos for the Reeses. Use the school colors to make a graduation cap from cardstock and attach it to a nugget bar for great graduation cap nugget favors for a graduation party. Quickly make a bowlful of yummy graduation hats with Peanut Butter Cups and card stock. Consider Rolos instead for peanut allergies. Quickly make a bunch of graduation cap favors with nuggets, card stock, and yarn. Top a Nugget with a card stock square and add a bit of ribbon with a brad to make quick and easy graduation cap nuggets. Stamp or draw graduation caps on card stock, punch or cut in a circle and attach to Peppermint Patties to create Peppermint graduation caps. To make graduation cap cookies, top a peanut butter cup (or Rolo – for people with peanut allergies) with a Keeblers Deluxe Graham cracker and finish with frosting and an M&M. Create graduation cap cups with a cupcake and a chocolate covered graham cracker square. Make a graduation cap with peanut butter cups or Rolos and chocolate covered graham crackers, and top graduation cap cupcakes with them. Create this graduation card box out of foamcore and a round basket or box. Friends and family can drop cards into a slot in the top. Great idea for a centerpiece. You can easily cut these shapes without a die cutter to make a grad cap gift box with craft foam. Make it larger or smaller according to the size of your gift. You could even make a large grad cap gift box of cardboard, by using or making a round box and attaching a large cardboard square to the top. Spray paint in school colors. Craft a graduation cap out of paper using a few origami folds. Make a wearable graduation cap with poster board and ribbon or yarn. Here’s another kindergarten graduation cap made with poster board and yarn. Use foam core board and poster board in black or school colors to make this easy paper graduation cap. Make this felt graduation cap in the school colors and it will be a great keepsake for a memory box. I made a cap out of money. Thank you for the inspiration. This is such a fun idea, I love it! Pinning. Thanks for sharing with SYC. Great ideas!! Thanks for sharing on My 2 Favorite Things on Thursday!! Hope to see you again tomorrow!! Pinned! !